"This cookie is incredible. It's so rich and tasty. I cannot tell how many times I get asked for this recipe. Everyone loves it and it's easy to make. These keep very well. You can make dough ahead time and freeze it. Defrost when ready to use and follow baking instructions. Great cookie for the holidays." Sift together the flour, baking powder and salt, set aside. In a medium bowl, cream the butter and sugar together until fluffy. Gradually stir in the dry ingredients, then stir in the walnuts and chocolate chips. Roll or scoop dough into walnut sized balls. Place them on unprepared cookie sheets 1 1/2 inches apart. Flatten cookies slightly. Bake for 15 to 20 minutes, until light golden brown. Remove from sheets to cool on racks. 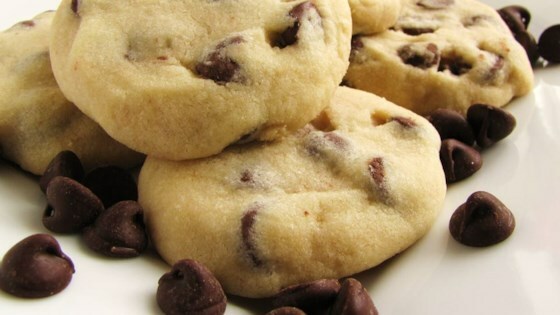 I just made these cookies and they were not good at all, the kids did not like them at all,Can someone tell me if maybe I did something wrong? I followed the recipe?